Is Biti slowly upstaging Chamisa! Harrington said charges against Biti were spurious. 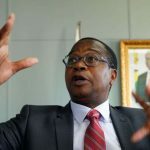 The Permanent Secretary for Information Nick Mangwana, however, said the United States had no right to interfere with Zimbabwe’s internal affairs as Biti was facing criminal charges. Biti is facing charges of inciting post-election violence on 1 August which resulted in six people being killed. He is also facing charges of declaring false election results. Bowing to United States pressure, Mangwana said, would be tantamount to double-standards. Flake, however, appears to have a soft spot for Biti. He asked Harrington how he felt about factions within the MDC and the fact that Biti was in Parliament while Chamisa was not. 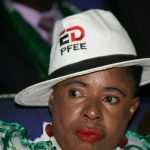 Harrington, a former United States ambassador to Lesotho and political officer in Harare, said: “The MDC has long been factionalised…. The MDC Alliance and Mr Chamisa himself have not moved beyond the election. I think they continue to challenge the legitimacy of the election. Mr Chamisa led a protest last week in downtown Harare challenging those results. I think clearly the election was not a level playing field, there were major issues with the election. It was better than past Zimbabwean elections but granted the bar is low in that respect.